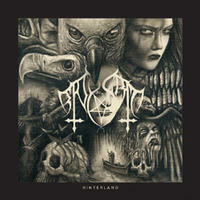 Ever since the beginning in 1998 BLODSRIT have screamed out their uncompromising black metal to the world! Now to their 10 years anniversary so release they their fifth album! They came follow up the release with tours both in Europe and North America! Came with a exclusive 24 pages booklet so was made by Lorenzo Mariani (1349, Darkthrone, Marduk, Mayhem, Thyrfing etc...)!